Mathare Foundation is a community based organization that provides educational programs and mentorship for disadvantaged youth in the Mathare slums of Nairobi, Kenya. Through hands-on training and technical workshops in photography,film production, performing arts (music and dance), sports, and stay in school programs, young boys and girls from Mathare can build confidence through learning new skills, discover opportunities for income generation, and envision and plot a course for future career opportunities in media and the arts. Mathare is a settlement of roughly 400,000 people where the vast majority of the population lives under the poverty index, in houses of mud and corrugated iron sheet. Mathare is the oldest slum in Nairobi and lacks basic services like sanitation, clean water, electricity, and passable roads. 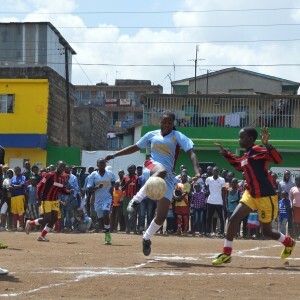 As in many impoverished areas, children and teens from Mathare are at incredible risk for unplanned pregnancies, involvement in drugs and alcohol, crime, prostitution, and gangs. In addition to these problems that can exist in large urban slums everywhere, children growing up in Mathare have an added challenge which is their proximity to neighboring Eastleigh, a well-known recruitment ground for the militant group Al-Shabaab. Our youth programs are critical in offering a safe respite for children ages 6- 15 years and youth of ages 17 to 25 years where they can uncover their talents and realize their potential to become young leaders in their communities and beyond. We strive to connect our students with opportunities to generate additional income and provide guidance towards higher education and certification programs where they can ultimately pursue exciting and viable employment and career opportunities. Since our inception in 2013, the Mathare Foundation has trained hundreds of children and youth from Mathare through a series of trainings and workshops. We have had numerous events in Nairobi and beyond to showcase young people work through photo exhibitions with partners such as French Embassy in Nairobi, Canon Middle East and Wing of Support, music and dance performances, sports competitions, and creative arts festivals. 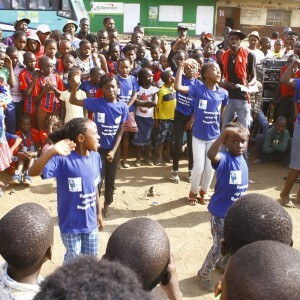 We have our annual Slum Kids Festival +254 which provides a multi-day creative arts celebration, inviting musicians, poets, dancers, and actors who blend entertainment with education on public health and social issues that Mathare youth face everyday. Eric Omwanda Nehemiah is the Executive Director who has benefited from youth programs during their adolescence in Mathare and directly understand the immense impact programs such as Mathare Foundation have on young people positive trajectory for the future. Eric Omwanda Nehemiah is an award winning young leader. In 2018, he won the Caroline Mutoko Scholarship which enabled him to attend the One Young Summit at the Hague,Netherlands. He is a recipient of the Resolution Fellowship Project. 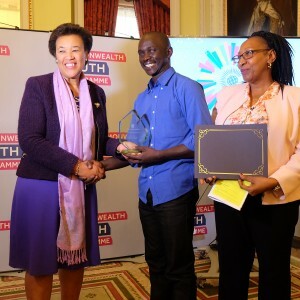 In 2016, Eric Omwanda Nehemiah won the prestigious Commonwealth Youth Worker Award for Africa in recognition for his outstanding dedication to improving the lives and futures of young people. The Mathare Foundation is looking for thoughtful, compassionate partners to help us achieve our highest ambitions, where Mathare’s youth have ample opportunities to unlock their limitless potential; where they not only have a chance to dream but also see their dreams realized. To train and create opportunities for children and youths in media, performing arts, sports, and leadership skills so that they become better citizens in their respective communities. To be a reputable organization in assisting children in the slum in media trainings, performing arts and sports so that we promote world peace and enhance improved livelihood for children and youths in Mathare slums.